In 1983, Alton Towers introduced a new attraction to the Fantasy Land area of the park. Known as the Black Hole, it was a Schwarzkopf Jet Star II model that then had a large tent erected around it. It originally was pitch black inside, but the park quickly added theming to the inside. One notable addition was to the lift and first drop, that originally featured a steep curve right after. Theatrical lights were installed, so that riders have a chance to the brace for the turn. A smoke machine was also installed. The ride ran like that until 1988, when the ride was dismantled and sent back to BHS (a german equipment company, whose amusement park division became Maurer-Sohne). BHS stripped down the ride to its basics and rebuilt the structure for a unique feature: double car trains. Normally, a Jet Star II can only run single cars, but BHS built a new fleet of trains that effectively doubled capacity. The ride stayed like that until 1998, when Fantasy Land was taken over by the X Sector. The formerly bright tent was repainted dark blue and black and a new entrance portal constructed. The ride eventually closed down in 2005 and the site taken over by the Smiler roller coaster in 2013. 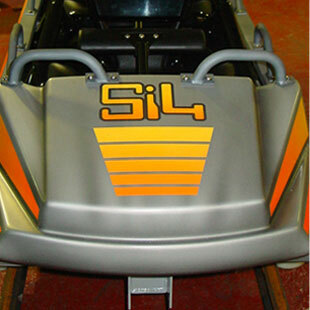 The ride itself still operates after another refurbishment by Gerstlauer at Furuvik in Gavle, Sweden. The ride was repainted blue and red and renamed the Rocket. 1984 saw another British park open a space themed roller coaster. Known as the Space Invader, the Pleasure Beach at Blackpool built a cubic meteorite building in one corner of the park. 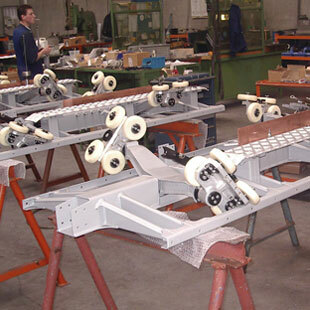 Inside, they placed a Zierer Four Man Bob roller coaster. This small compact roller coaster was well adapted for an indoor application, as the ride feature a lot of tight curves in a small area. The small four person cars were themed to rockets and feature two benches, similar to the original Matterhorn and Walt Disney Space Mountain vehicles. The waiting line was elaborate, with many scenes that turned it into what could be considered a mini walkthrough attraction. It simulated walking through both a working space station and various scenes of famous science-fiction movies. On ride, the ride featured a large satellite hanging from the ceiling and an enclosed lift. Once the ride got going, there were many alien and spacemen statues that riders would fly past. There were also various portals and light fixtures that made this a very dynamic and visually pleasing attraction. The ride ran well, but unfortunately, there was an incident in 2000 that caused extreme modifications to the ride. Even through the park was not blamed for the incident, it lead to an extreme modification of the ride. In order to restrain riders beyond the already present seatbelts, park maintenance personnel retrofitted spare over the shoulder restraints to the ride vehicles. They had to extend the headrest to make space for the shoulder bar ratchet. The restraints themselves were old Arrow Development horse collar restraints that had been used on the Revolution shuttle loop at the park. The result was a disaster, as it both slowed down lines to a crawl due to having only two riders per car and also, it caused damage to the attraction. Both the added weight and taller center of gravity wreaked havoc on the structure and thus, after the 2003, the ride was closed. Kumbak—The Amusement Engineers were called in and did a nearly complete rebuild of the attraction. A new lift system, new cars, a new control system and new Eddy-Current magnetic brakes were only a few of the upgrades done to the ride. They even reinforced the structure and built new track sections to smoothen it out. 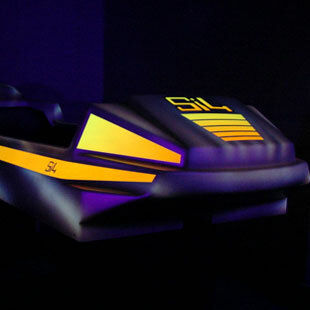 The ride reopened in 2004 under the Space Invader 2 name. 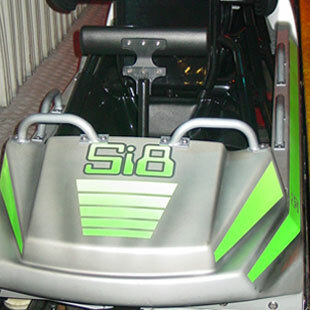 The new ride cars had 3 individual seats with each rider restrained by a hydraulic T bar. It ran well until 2008, when the ride was closed down due to a messy ride evacuation. That lead the park to close down the ride and put it on sale. In July 2010, the Pleasure Beach announced the ride had been sold to Brean Leisure Park in Brean, UK. The ride was carefully dismantled and transported to its new home. It would remain an enclosed ride, as a brand new building was constructed to house it. The theme would remain space travel, but a new ride was selected: Astro Storm. The outdoor waiting line has a video explaining the premise. Once we board, we have a nice dark ride scene with a large screen and then a right turn into the lift hill. The lift hill is enclosed and at the top, another screen has our flight controller saying to “abort the mission!” The ride itself features many lights and props scattered around the turns and dips. The new Kumbak ride cars. You can notice the hydraulic lap bar and the chain and anti roll back ratchets under. The chassis of the new cars. A glow in the dark paint job was applied to the cars with a beautiful result. 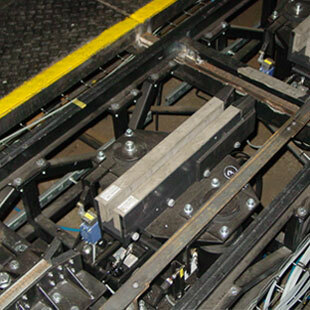 The new actuated Eddy-Current magnetic brakes used to slow down the ride vehicles. The five pictures above were provided by Kumbak- The Amusement Engineers. This entry was posted in Coasters and tagged Alton Towers, Blackpool, Imagineering, Kumbak, Pleasure Beach, Zierer. Bookmark the permalink.